Read by the author, this is a mesmerizing story of love, betrayal and pain. I’ve read a few of Morrison’s books and I always have trouble with them. For me, the words lack a certain rhythm and I find myself re-reading pages that I’ve just read. I never understood the draw. That said, my book group chose A Mercy for October’s discussion and I was sort of dreading it and looking forward to it at the same time. For one, it’s been years since I’ve read one of her books. Perhaps I’ve grown as a reader. Perhaps my experience this time will be different. I promptly went out and got the book, read a chapter or two and then stopped. Nope, still the same. Still haltingly strange for me. So then I ordered the book on audio. 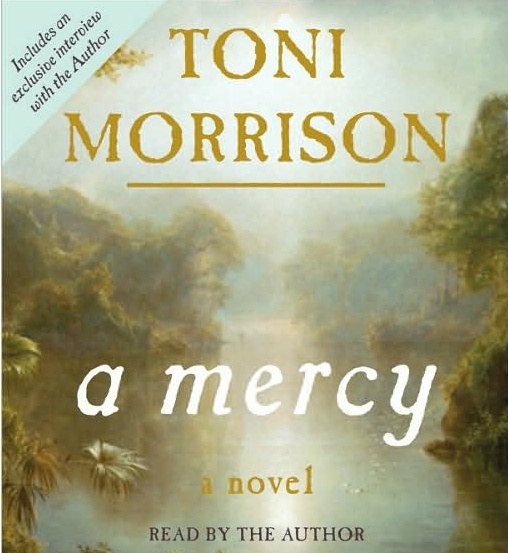 It’s read by Toni Morrison and I figured that if it didn’t strike a chord with me, and she was reading it as it was meant to be heard, then I would give up on Morrison altogether. I’m happy to report that I loved it! Morrison’s voice is melodic at times but definitely has a certain cadence to it. That haltingly strange way of speaking that I mentioned in the book form, is present in her speech patterns, but hearing her voice brought it all together for me. I then went back to the book and had no problems reading it. Have you ever done that? After smoothing all this out, I settled into the story and found it to be haunting at times, yet the strength of these women amazed me. There is a wonderful interview with the author at the end of the audio book which should not be missed. Now that I’ve had this experience, I plan to re-read some of her other books. Have you ever had a hard time reading a famous author and then wondered what all the fuss was about? Have you ever resorted to the audio book to see if it was different in some way? I adore Morrison, mostly thanks to an amazing college seminar that focused entirely on her work. It's not the most accessible, but I always feel like reading her is worth the work. So glad you enjoyed this one. I've had the chance to hear her read in person, and you're right, her rhythm and voice add a lot to the experience. Are you going to re-read the other books or listen to them on audio? I can't say I've ever turned to the audio when a book wasn't working for me, but I'm glad it worked out for you. I've read a few Morrison novels, and I agree that the style takes some getting used to. J.T. – I am going to read them in book form. Now that I get the cadence, I am thinking it might be a totally different experience. You have more perseverance than I do! If a book isn't working for me, I've enver once considered the audio instead. That said, I used to teach Morrison's Beloved to very surly, unhappy groups of college freshmen. I loved it (although haven't necessarily loved her others) and wondered why they grumbled about it so. Perhaps the narration was a part of it for some of them (disliking reading in general was part of it for others ::sigh::). Doesn't Morrison's voice just make you melt? It really did make the story for me to have her reading it. You really gave this book your all! I'm glad that in the end you were able to enjoy the story. Nothing annoys me more than when I have to back-track and re-read pages because I'm just not gettin' it! I've not read any of her books, but I'm sure I will one day. This one does sound very interesting. Great review, Ti, with great insight as well. I'm glad to see you loved it too. I will have to remember this the next time I struggle with a book. I'm actually re-reading The Bluest Eye at the moment and still in awe at her goodness. But I loved that you really liked this! Haven't read it yet, but plan to soon. I started this three times on audio, and I couldn't figure out what was going on. I loved listening to it, but I couldn't follow it. I'm glad you gave Toni Morrison another chance and had a good experience! I've read Sula and The Bluest Eye and loved both. A Mercy is on my TBR list. Interesting strategy Ti! I do often find that an audio can be a little like force-feeding. It just goes, and you listen, even through the slow parts. Usually I will always listen to an audio if the library has it, and will only turn to the hard book when there aren't any in stock. I know this sounds bad, but there are many books that aren't carried on audio. I haven't read anything by Morrison, usually because the reviews are bi-polar. I know, shame on me. I like Morrison a lot. I actually got the audio version from the library when it first came out, but after listening about 30 minutes, I decided it seemed I would enjoy the print version more. Still waiting to read it. I did get a used copy. I'm glad u liked it Ti. I've always been too intimidated to try anything by Morrison, worried that I won't "get it." Audio seems like a great way to get over that. Great that this worked on audio, and I admire you for being willing to go back and try again to read it (now that you have Morrison's voice/cadance in your mind). Let us know if it works, or if you'll be sticking to audio for her books. Interesting way to get through on a book you're stuck on. I too have been told Toni Morrison is a must-read. I've downloaded Mercy from the library. Now I'm anxious to listen to her. Thanks. Her books have been kind of hit and miss for me. I had no problem with Song of Solomon, but had a hard time getting into A Mercy. I will have to give the audiobook a try, because I do want to read the book at some point. I've had trouble reading this author's work and maybe this is why!! !I think it was ingenious of you to try it on audio. I'm glad it cleared up your reading problems. Perhaps I'll experiment with this approach and this author someday.